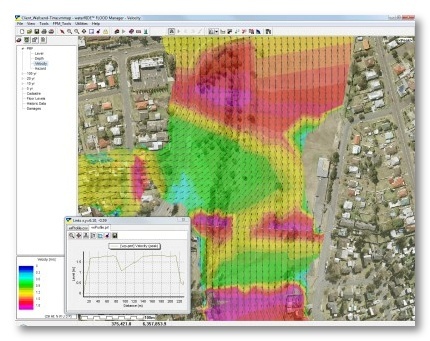 waterRIDE™ 1D Surface provides users with the common waterRIDE™ geospatial interface to assist in the conversion of one dimensional model results into a two dimensional spatial dataset. 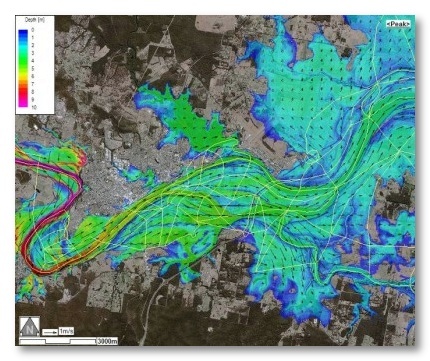 The aim of waterRIDE™ 1D Surface is to create a 2D framework for 1D model results, which can then be used in waterRIDE™ FLOOD Manager as if they were 2D model results, including the full time series of water levels, depths, velocities, velocity times depth, hazard, bed shear etc. Time-varying results from branch/cross-section models such as MIKE 11 & SOBEK 1D, and node/link models such as EXTRAN & ESTRY can be converted into triangulated 2D networks. Steady state models such as HEC-RAS (traditional) and DRAINS along with simple stream profiles can be converted into peak surfaces of water level and velocity (where available). GIS cross-sections and/or points with water levels and velocities attached as field data, and even hard-copy results can be converted into 2D surfaces! 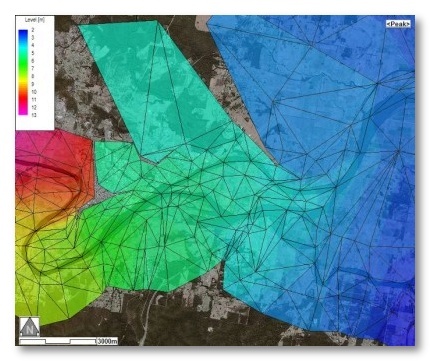 The interface includes tools for conditioning the triangulated network to best fit the floodplain recognising that 1D models do not always cover the full lateral extent of flooding. These semi-automated tools allow the rapid creation of well-conditioned 2D surfaces through on-screen editing. Once the 2D framework has been prepared from the 1D base data, the relatively coarse model network can be mapped onto a finer scale DEM (TIN and/or Grid) using waterRIDE™ FLOOD Manager. The framework building process stores a list of “changes”, thereby making the conversion process automatic, should your underlying model results change. waterRIDE™ 1D Surface allows you to interpret your 1D model results onto a 2D surface, on behalf of your model results users. Nodes can be moved to stretch and appropriately align the network. 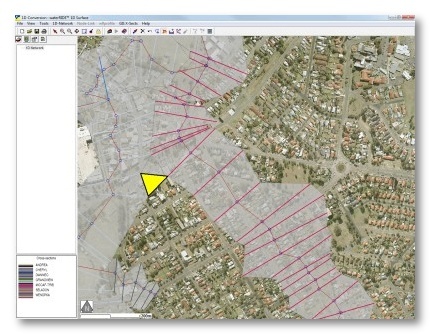 The coarse 2D framework created by triangulating cross sections is now ready for mapping to a finer scale DEM. Once the network has been conditioned for a 1D model framework, all model “runs” can be batch processed using the common framework. If your model results subsequently change, simply click the “process” update the results! 1D models are “revitalised” by converting them into 2D space. Flow (velocity) can be distributed across each cross section using Manning’s equation to provide a realistic interpretation of flow velocities. The figure to the left shows a velocity profile across a model cross section with two main flow paths. Triangles can be manually added to ‘stitch’ tributaries to main branches. waterRIDE™ 1D Surface is designed to be used by flood modellers. It requires some hydraulic understanding to ensure that the 2D surface created from the 1D model results provides a hydraulically sound representation of the model. waterRIDE™ 1D Surface is available as both standalone and network (LAN/WAN) license. waterRIDE™ 1D Surface is designed to prepare water surface files for use in waterRIDE™ FLOOD Manager.